In the shadow of the Super Speedway at Las Vegas there sits a semi-banked half-mile dirt track who tonight held more promise and more excitement than the strip of casinos that overlook its backstretch. The pay off was not in the slots or at the tables tonight, but in the dirt of a bull ring that is part of a motorsports dream come true. Tonight at one of largest tables in motorsports, the Outlaws rolled a seven and the reigning champion Donny Schatz was holding the dice. The night was a long one. The Outlaws as a rule only have one support series with their show. But tonight they had three. With the Outlaws action not starting until after 9 p.m. east coast time, the action ran into the early morning hours. The first hint that this would not be a normal night came in the hot laps when the same group of cars held the top-five times through all four sessions. Lucas Wolfe would lead the way with a lap of 14. 891 seconds or 120.878 mph. It was off Donny Lasoki's track record of 13.719 by over a second. Qualifying was more of the same. Wolfe was the first qualifier and set quick time with a lap of 14.593 seconds. That time would stand for 41 other qualifiers. The closest anyone came was Paul McMahan who turned a lap of 14.893 seconds. The track slowed dramatically during qualifying and never regained the speed. The rest of the top-five qualifiers were Joey Saldana, Chad Kemenah and Cody Darrah. The first heat race was a duel between an old master and the little giant when Sammy Swindell and Rico Abreu battled for the win. Sammy came out on top but only by a breath. Behind them Cody Darrah and Lucas Wolfe battled to the line with Darrah taking the spot by a nose. Rounding out the transfers was Terry McCarl. The second heat was never really challenged for. 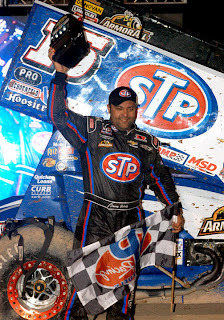 Donny Schatz took the lead at the green and lead wire to wire with Kyle “Yung Money” Larson giving chase but coming home in the runner-up position. The real race was for the final transfer spot between Craig Dollansky and Paul McMahan with Dollansky taking the spot out of the fourth turn to beat McMahan to the finish. Also transferring were Daryn Pittman and Brady Bacon. The third heat was a battle between Wayne Johnson, who made his first 410 start at Las Vegas, and Brian Brown. Brown took the lead with two laps to go and pulled away. Kraig Kinser and former Outlaws Champion Jason Meyers were followed by Joey Saldana to the line to round out the top-five. The final heat of the night showed promise of being a barn burner. Tim Kaeding held off a hard charging Jason Sides who was battling with a strong Tony Stewart. Steve Kinser faded late but came home ahead of Chad Kemenah to transfer to the A. The Dash was an exciting race of six laps. An inversion draw of eight put the reigning champion on the pole, but the competition in the field was not to be underestimated. Schatz jumped out to an early lead and lead all the way to the white flag when Jason Sides slipped by on the high side to take the win. Battling with them two sometimes three wide was Kyle Larson who came home third. With the top-five rows of the feature set, the evening looked to be an exciting adventure in speed. But first there were four more positions to be filled. Those positions would come from the Last Chance Showdown or B Main if you will. With 42 cars in the pits the B Main boasted a 21 car starting field. But in the end Mark Dobmeier and Mitch Mack would scratch for the night leaving 19 cars to take the green flag. They say the cream rises to the top. In this case that was very true. Paul McMahan lead from the drop of the green and was pursued every inch of the way by David Gravel who was substituting for an injured Bill Rose. In their own battle for third and fourth were Kyle Hirst and Logan Forler. Hirst took the third spot and Forler the final transfer out of the B. Just out of transferring were Sam Hafertepe Jr. and Kerry Madsen. Hafertepe took it to the trailer for the night and Madsen used a provisional to make the A Main. Also not making it in to the A were former champion and track record holder Danny Lasoski and Jason Johnson, reigning American Sprint Car Series Champion. With the A Main lineup set the night was beginning to change. Even the voice of the Outlaws Johnny Gibson seemed to be growing weary. When the green flag dropped it was nearly midnight on the east coast. Donny Schatz jumped out to an early lead taking the cushion around the half mile track. Jason Sides immediately challenged from the bottom. The two went side-by-side and back and forth neither able to get away from the other until the first yellow came out on Lap 8 when Paul McMahan went around on the high side of three and four. Brian Brown and Jason Sides were dueling for the second spot making it a three way battle for the lead. Schatz held true to the high side making the cushion work for the STP No.15. Enter Kyle Larson who began to challenge Brian Brown for third and on the restart on Lap 12 took the second spot and began to push Schatz for first. Larson took the lead in one and two when Schatz bobbled on the cushion. Larson pulled away and held the lead until Lap 28. Schatz and Sides would battle hard for second with Schatz able to hold off Sides. On lap 28 Larson entered heavy side-by-side traffic and Schatz shot to the bottom of the track and slid by Larson to retake the lead and ultimately the race. Kyle Larson, who came home third after being beat at the line by Jason Sides, said he ran out of fuel at the end, made a lot of mistakes, was terrible on the restarts but had the car to beat at Vegas and he would be back tomorrow night. The night continued with its oddities. Steve Kinser came home an uncharacteristic 17th. Sammy Swindell would finish 14th. Tony Stewart wouldn’t finish at all. Paul McMahan would break a front wheel bearing. Craig Dollansky would come home 15th. The series points leader finished a dismal 16th. The night was a rarity, a strange night of strange happenings. But the Outlaws raced every lap. They raced hard every lap. They raced to win every lap. In the end the Champ rolled a seven and came home a winner. When it was over he gave credit to the youngster and the challenger. He paid tribute to his team. And once again Donny Schatz showed us why he is a five-time series champion. Qualifying results: 1)Lucas Wolfe 14.593 2) Paul McMahan 3) Joey Saldana 4) Chad Kemenah 5) Cody Darrah 6) Daryn Pittman 7) Kraig Kinser 8) Tony Stewart 9) Sammy Swindell 10) Kyle Larson 11) Brian Brown 12) Jason Sides 13) Rico Abreu 14) Donny Schatz 15) Wayne Johnson 16) Tim Kaeding 17) David Gravel 18) Craig Dollansky 19) Jason Meyers 20) Steve Kinser 21) Glenn Styres 22) Sam Hafertepe Jr. 23) Logan Forler 24) Mark Dobmeier 25) Terry McCarl 26) Brady Bacon 27) Danny Lasoski 28) Kyle Hirst 29) Jason Johnson 30) Jason Solwold 31) D.J. Netto 32) Mitch Olson 33) Kerry Madsen 34) Roger Crockett 35) Austen Wheatley 36) Greg Wilson 37) Carson Macedo 38) Johnny Herrera 39) Henry VanDam 40) Mitch Mack 41) Jody Rosenbloom 42) Shawn Peterson. Peterson failed to scale following his run so his time was disallowed. First Heat Race: 1) Sammy Swindell 2) Rico Abreu 3) Cody Darrah 4) Lucas wolfe 5) Terry McCarl 6) Kerry Madsen 7) David Gravel 8)Jason Johnson 9) Carson Macedo 10) Jody Rosenboom 11) Glenn Styres. Second Heat Race: 1) Donny Schatz 2) Kyle Larson 3) Daryn Pittman 4) Brady Bacon 5) Craig Dollansky 6) Paul McMahan 7) Sam Hafertepe 8) Jason Solwold 9) Johnny Herrera 10) Roger Crockett. Third Heat Race: 1) Brian Brown 2) Wayne Johnson. 3) Kraig Kinser 4) Jason Meyers 5) Joey Saldana 6) Logan Forler 7) Henry VanDam 8) Danny Lasoski. 9) Austen Wheatley 10) D.J. Netto. A Main: 1) Donny Schatz 2) Jason Sides 3) Kyle Larson 4) Tim Kaeding 5) Kerry Madsen (Hard Charger) 6) Brian Brown 7) Joey Saldana 8) Jason Meyers 9) Cody Darrah 10) Lucas Wolfe 11) Brady Bacon 12) Chad Kemenah 13) David Gravel 14) Sammy Swindell 15) Craig Dollansky 16) Daryn Pittman 17) Steve Kinser 18) Kraig Kinser 19) Kyle Hirst 20) Logan Forler 21) Rico Abreu 22) Tony Stewart 23) Wayne Johnson 24) Paul McMahan 25) Terry McCarl. GREAT ARTICLE, YOU NAILED IT. IT WAS THE MOST EXCITING RACING I'VE SEEN IN ANY LEVEL OF RACING BAR NONE!Keep up the good work.World of Outlaws and dirt track racing in general needs writers that understand and are capable of bringing the much needed and deserved attention articles like this can bring..